Jamie Whincup finally enters the Club 100! The six-time V8 Supercars champion takes his 100th series victory today at Sydney Motorsport Park, in the 19th race of the 2016 championship. He waited for this since July and his 99th win at Townsville street circuit. After Townsville, he was in the second place three times in a row, two times at Queensland Raceway and yesterday at Sydney’s circuit. 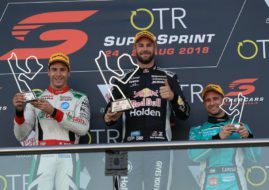 Whincup becomes only the second Supercars driver to reach 100 race wins, joining his teammate Craig Lowndes in the Club 100. Lowndes collected 105 wins so far. Lowndes was Whincup’s main rival in the Sunday’s race at Sydney Motorsport Park. Lowndes started from fourth place on the grid and jumped to the lead on the opening lap, passing pole-sitter Chaz Mostert. Whincup started third on the grid. After the first round of pit stops on Lap 10, Whincup was second. On Lap 30, two Triple Eight drivers pitted together, Whincup’s crew was faster and he took the led. After 200 km of racing, Whincup’s Red Bull Holden Commodore crossed the finish line 2.58sec ahead of Team Vortex Commodore. Two Ford Falcons of Chaz Mostert and Fabian Coulthard finished third and fourth. Red Bull’s Shane Van Gisbergen, the winner of Saturday’s race, finished fifth. Scott McLaughlin brings GRM’s Volvo S60 to sixth place. The pairs of Holden Racing Team and Nissan Altima drivers completed the top 10 – Garth Tander, James Courtney, Todd Kelly and Michael Caruso. After 19 races, Whincup remains in the championship lead. He had 137 points more than Shane van Gisbergen and 198 points more than Craig Lowndes. The defending champion Mark Winterbottom is fourth, with 273 points less than Whincup. The next race would be the Sandown 500 at Sandown Raceway, the first of three endurance events.